1988 saw the continued development of the now famous “Air Jordan” produced by Nike for Chicago Bulls great Michael Jordan. The “Air Jordan III” was the first basketball shoe to feature the “JumpMan” symbol on the shoe. 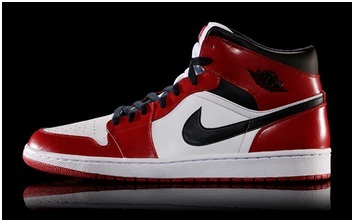 That stretched out dunking figure representing Jordan has since become the official logo of the Jordan Brand. Patrick Ewing made a short foray into the shoe business in 1989 producing the “Ewings 33 Hi,” which featured ankle straps. The company didn’t make it but the concept of the ankle strap has been used ever since. One of the most unusual basketball shoes of all time were made famous during the 1991 NBA Dunk contest. We saw basketballers of all ages reaching down to add more air to their “Reebok Pumps”. These popular high tops were designed to inflate for ankle support. Probably the most popular Air Jordans of all time was the “Air Jordan XI” which came out in 1995. The good looking black and white patent leather shoes went well with any teams colors. These classic sneakers can still be seen on professional and colligate courts today. Kobe Bryant went to the Lakers right out of high school and he did so as a headliner for Adidas Basketball in 1997. The first shoe that Kobe backed was the Adidas “Crazy 8” which set a new standard for cool on the NBA courts. LeBron James hit the NBA in 2003 wearing his very first signature Nike sneakers. They were known as Nike “Air Zoom Generations” and each year after the debut saw a new version of the shoe. No serious sneaker collector could be without at least one pair of these modern classics. Then, in ’97 Kobe switched over to Nike Basketball and together they came out with the “Kobe V” which was one of the lightest, most elegant looking basketball shoes of all time featuring the Lakers Purple and Gold on a slick black background. Of course, we would expect nothing less from the “Black Mamba”. Chicago Bulls great Derrick rose inspired the “AdiZero” which brings to mind the classic type of design that Converse based their original high tops on nearly a century earlier. Of course, modern materials and techniques make the AdiZeros are more supportive and lighter but the concept remains the same. To commemorate his 10th year in the NBA, LeBron James and Nike came out with the “LeBron X” which might just be their crowning achievement.